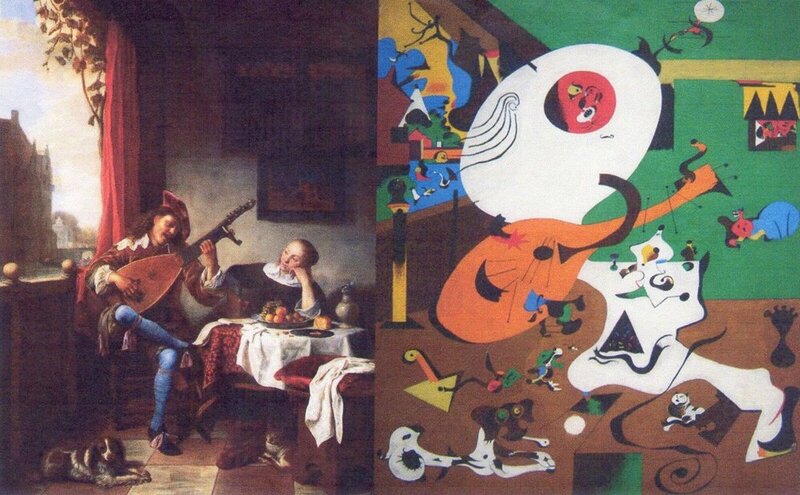 A long time ago I came across a fascinating pair of images: “The Guitar Player”, by the old Dutch Master Hendrik Sorgh, and the Spanish painter Juan Miro’s transformation of it. Elements from the original had been retained, but morphed into Miro’s visual language, along with certain basic aspects of the composition – the division of the space, the diagonals and so on. But certain things were not in the original at all: the scene is populated with Miro’s own inventions: cryptic creatures, hieroglyphics and quasi- symbols. Certain aspects were exaggerated entirely – the whiteness of the guitarist’s face; other aspects entirely changed – the greenness of the back wall. Over the years, over the decades, the images grew on me. I began to realise that something like this had been forming in my mind around the music of Debussy. After a long gestation time I committed an idea to paper. The result was a piano piece based on the Prelude “Le vent dans le pleine”. In this piece, entitled “Windgames”, I kept the proportions of the piece close to the original, so that the basic contours are the same: my music ascends when the original ascends, it descends when the original descends, it hovers when the original hovers. Thunder and lightning crashes when it does in the original piece. But the gestures are transformed, distorted or amplified in different ways. The harmony is blurred and “problematised”, adding to the feeling of insecurity, wandering, homelessness and loneliness. There are elements in this piece which are identifiably “me”, however. Anyone familiar with my work as a composer with Loose Tubes, my own bands, or commissions, will recognize certain fleeting intervallic constructions, juxtapositions of harmonies, or piano sonorities. The experience of writing this piece told me that there was more to it than just one work for solo piano. Next came something for the Moog Ensemble, “Snowsteps”, based on “Des pas sur la neige”, another Book 1 Prelude. This was similar in some ways to “Windgames”, involving warpings of harmony and extensions of melodic material; but also introduced new elements: there are several places where the progress of the original piece is suspended and a distant sound is revealed, like a choir of angels or howling wolves – again adding to the wintery sadness of the original. There are also swirls of chromatic notes like the whorls of a snowstorm. As a compositional discipline this project has become fascinating, inspiring and liberating for me. There is a sense in which it could not have happened before now: as I have encountered other musics, embraced and explored them, and periodically come back to Debussy, a synthesis has emerged. My orbit around his music has been an elliptical one. The concept has continued to grow. I began to imagine a larger ensemble and an approach which involved improvisers as well as readers. Alongside my own compositional transformations, I hear elaborations from other cultures, unexplored new instrumental sonorities, the excitement of the unexpected. A team of brilliant, trustworthy and inspiring colleagues from different genres of music will help make this vision a reality.